Located in Seagrove Beach - 1 mile from the center of Seaside Square The Beacons Condominium's is the best kept secret along Scenic Highway 30-A. 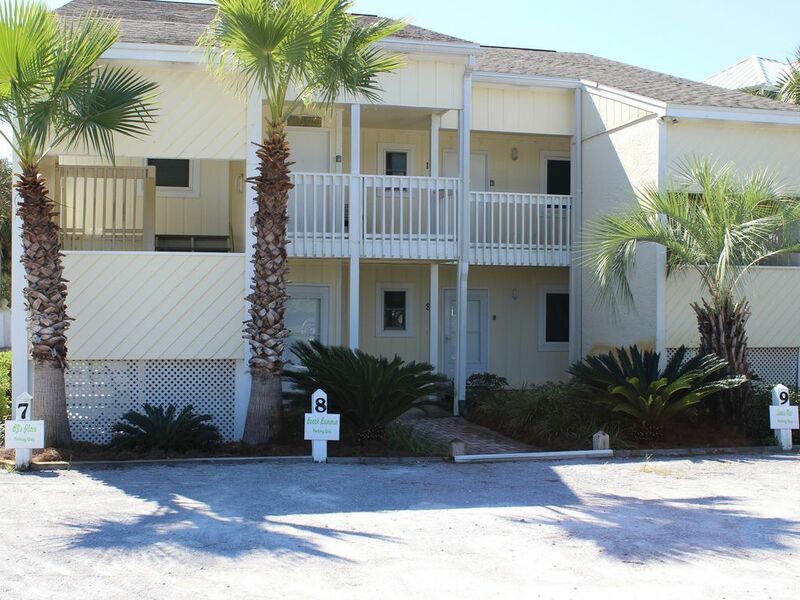 Our 2 building, 10 unit condominium complex is nestled between million dollar private homes with our own private beach boardwalk. Our Beacons condo #7 is in the second building back from the beach. We’re on the BEACHSIDE side of 30-A so there are NO ROADS to CROSSs. In fact, you can walk from the patio of our ground floor condo to the beach in about 70 steps. The location of our condo is perfect! Not only are we on the beach side of Scenic Highway 30-A but the 16-mile jog/walk/bike path along 30-A is just outside our door. Hop on your bike and you’ll be in the beautiful village of Seaside in about 5 minutes or one of our favorite activities is to bike ride to Grayton Beach state park and rent a canoe for the afternoon and enjoy the beautiful coastal dune lakes that are native to this part of Florida. We have many repeat guests who stay in our condo year after year and new guests love our “guest book” where previous visitors leave tips and suggestions as to places to eat, shop, or things to do in the area. Our condo has a fully equipped kitchen and sleeps 4 with a spacious master bedroom and large hall bunks that kids especially love. We would love to have you make our condo YOUR vacation destination. We love to spend time at the beach and we have made our condo have the comforts of home. One designated Parking Space. Due to limited parking, our Condo Association does NOT ALLOW Golf carts. This condo is a wonderful location, and the perfect size for a getaway for a couple or a small family. We had everything we needed, and walked to Seaside each day. Would definitely stay here again. The condo was great . The location is fabulous. We walked down the beach to Seaaide for an afternoon drink . We walked to breakfast several mornings . The condo is on the beach side which is not always easy to find on 30A. I do hope it is available on our next visit . 💥� and of course, needless to say, the Gulf was several shades of magnificent blue , the sky was blue and the beach sparkling white . We had a wonderful week . We are glad that you enjoyed your vacation. We also feel it's in a great location. Please let us know if we can ever help you again! Clean, neat convenient to beach. Short walk to Seaside and shops, restaurants close by. We had a wonderful week in this lovely ground-floor unit condo. It is just a short walk to the beautiful sugar white sandy beach & extremely convenient with children. We were able to easily carry all our beach chairs & floats without crossing busy highway 30A! Being on the same side of the road as the beach was a definite plus for our family, with 2 girls, ages 10 & 13. Since this condo area was very private, the beach was never crowded. The unit, itself, was extremely clean, well-stocked & suited our needs perfectly. We had plenty of supplies to cook meals & the shared washer & dryer was a definite asset! We were able to maintain our laundry at our convenience. The girls loved the bunk beds in the hall. The property owners were a pleasure to deal with--kind, & helpful!! We couldn't ask for more!! We will definitely return to this condo again. We had a wonderful time in this lovely condo so close to the beach. We will stay here again because of its proximity to and location on a less-crowded section of the beach. Only single family homes and small condos nearby, so not nearly as densely populated. When we compared condos on vrbo, we considered which condo photos showed fewer umbrellas on the beach to find a quieter beach. There were only two high-rises in the vicinity and they were quite a distance away to the east, maybe a half mile. We weren’t familiar with this area and feel fortunate we located just the right community for our vacation. Seaside is beautiful. The condo was clean and insect free. The first floor unit made it easy for us to get to the beach quickly and return without hassle. Used to having their own room at home, our teens were fine with the bunk bed arrangement and cooperative with having only one bath. The bathroom was nice and updated with a strong shower. It was great having access to a washer/dryer. Even though it was shared with another condo, we didn’t see them until the weekend, and they didn’t use the w/d while we were there. The neighbors were quiet. The owners were easy to work with. Nothing broke during our stay except for a burned out lightbulb. They provided a little to get you started, but be sure to bring your own supplies: soap, tp, paper towels, laundry & dishwasher detergent, extra washcloths and condiments/spices for the kitchen. We spent most of our time on the beach, some on the bike trail, and some shopping and dining in Seaside. It is easy to bike to Seaside and worth considering biking rather than driving. Parking in Seaside was challenging during this peak season week, especially on a Wednesday night during the weekly concert. You can also take a mile-long walk on the beach west to Seaside to the obelisk. Carry your shoes so you can walk around the shops, dining and restrooms once you get there. We had a front row seat to the 4th of July parade--it passed right by the condo. Since it was early in the parade route on 30A from Sea Grove to Seaside, we received lots of goodies including frisbees, candy and beads.